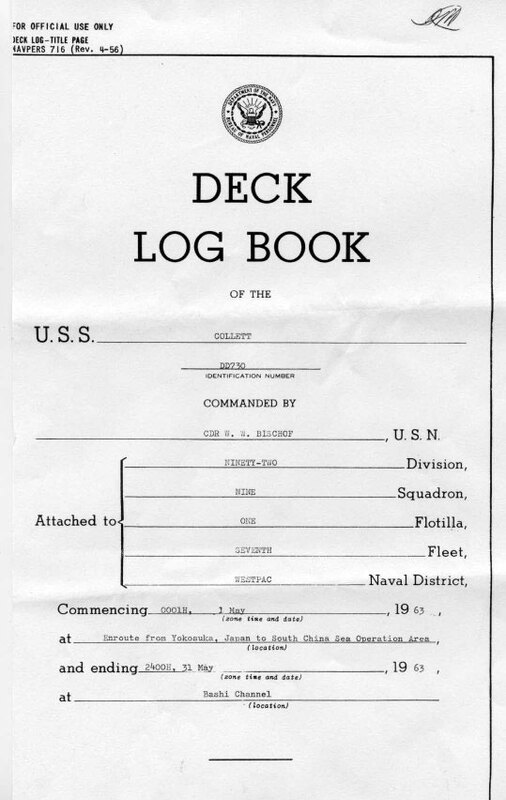 A deck log is an official USN record, but some former sailors, like me, never even saw one while on active duty. 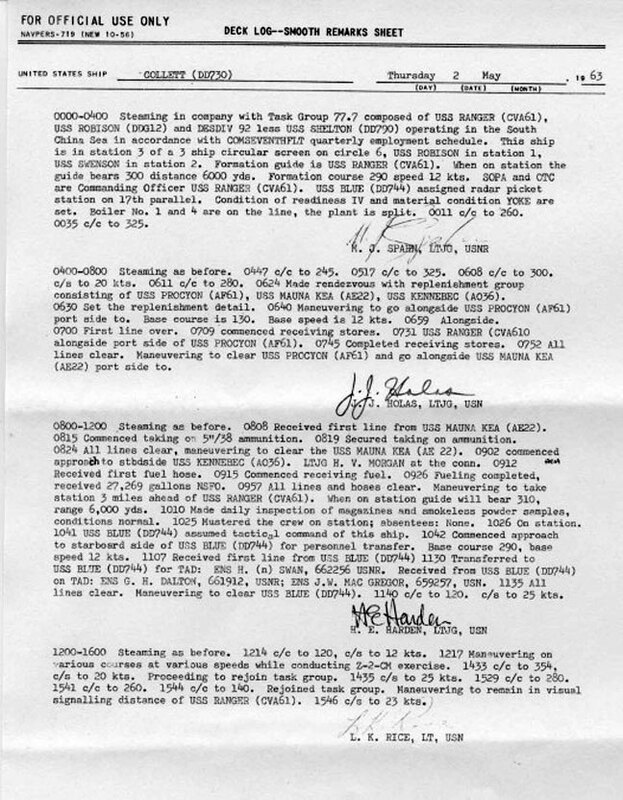 According to the www.history.navy.mil website, a Navy ship's deck log is a daily chronology of certain events for administrative and legal purposes. 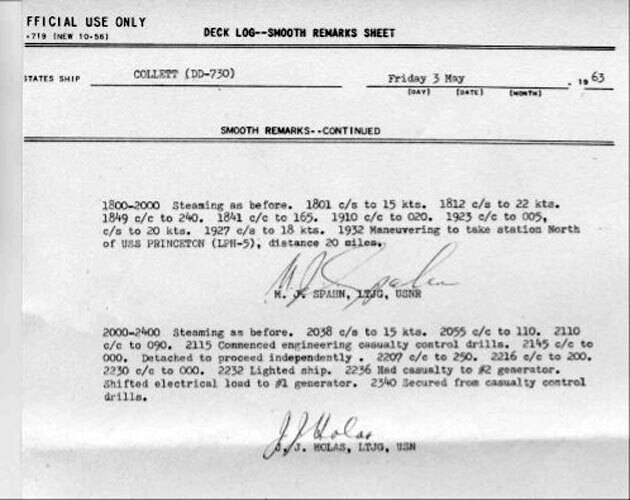 A deck log identifies a ship's location and movements daily. If the ship is underway, its latitude and longitude are to be entered three times each day in blocks provided for the purpose. [Latitude and longitude were not seen in COLLETT's log for May 1963; perhaps the RANGER's log includes them.] Deck logs are not narratives, and do not describe or explain a ship's operations. At the other end of the spectrum is a personal log, which is quite unofficial and of course should never contain security information. To view the deck log pages for these five days, please see below. 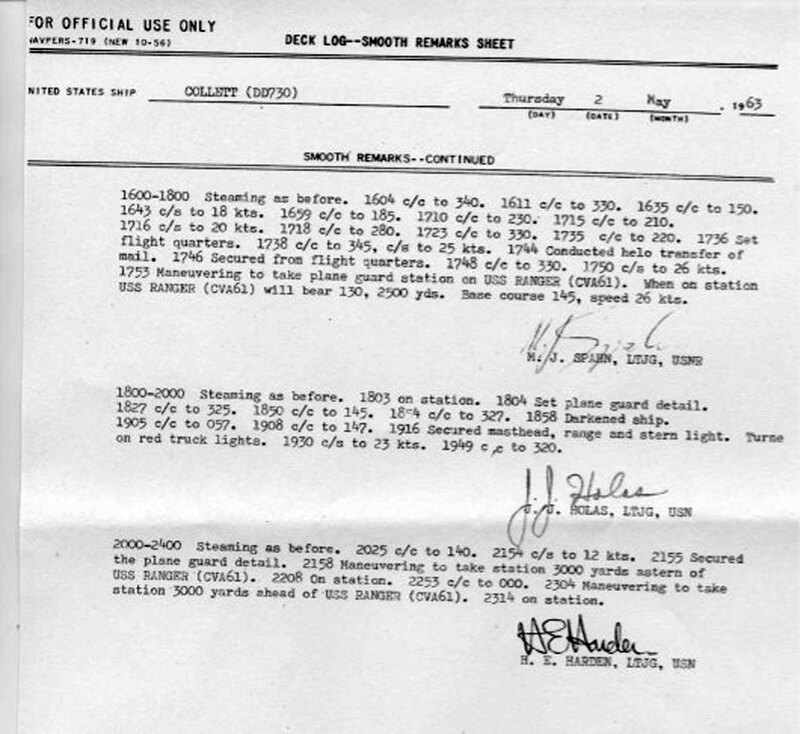 The cover page of the Deck Log Book indicates that the book is for the month of May in 1963, however only pages for 1 May through 5 May are included below. The commencing and ending locations for the month are given, where according to my altas, the South China Sea is bordered on the west by China and Vietnam, to the north by Taiwan, the east by the Philippines, and the south by Malaysia; and the Bashi Channel is between the South China Sea and the Philippine Sea, just north of Luzon. 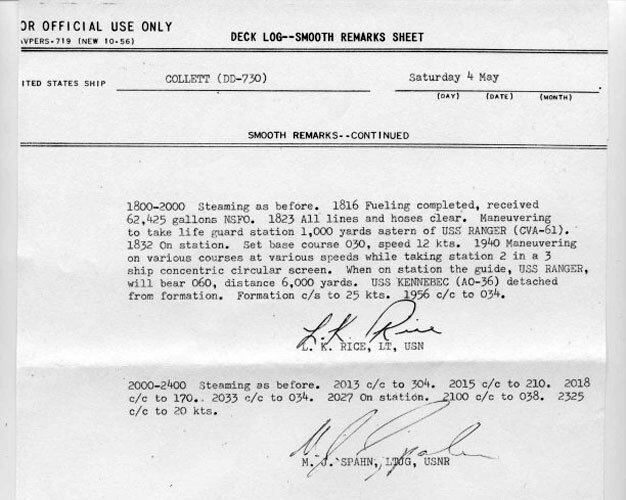 According to the deck log, during these five days, the USS COLLETT operated with the USS RANGER (CVA-61), USS SWENSON (DD-729), USS BLUE (DD-744), USS ROBISON (DDG-12). Replenishment was from USS MAUNAKEA (AE-22) and USS KENNEBGEC (AO-36). The USS SHELTON (DD-790), although part of DESDIV 92, was not present during these 5 days. 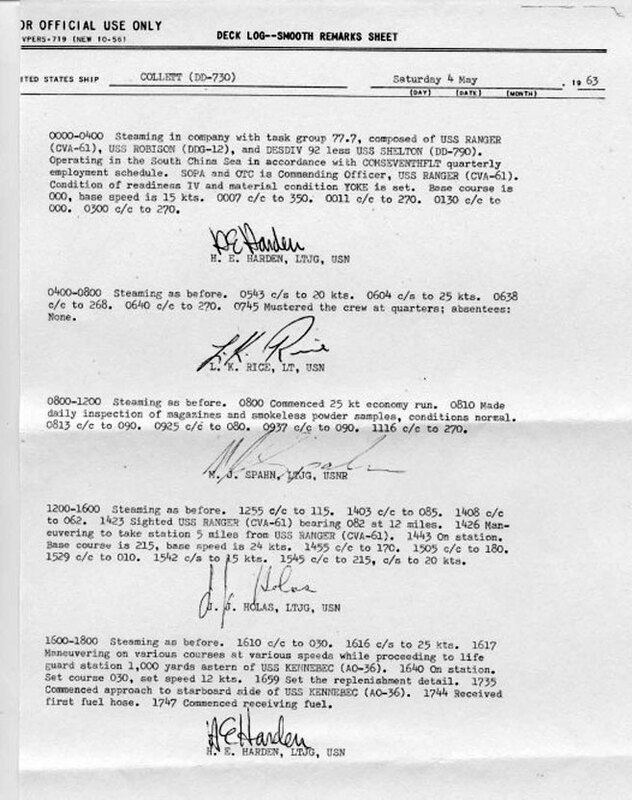 COLLETT was part of task group 77.7 and performed many evolutions during these five days including general quarters, flight operations, the helo detail, personnel transfer (via high line), (underway) refueling (from a carrier and later an oiler), rescue destroyer station, plane guard detail, (underway) rearming (of 5"/38 ammunition), darken ship, engineering casualty control drills, mustering the crew at quarters (each day), and the special sea detail (for arriving in Hong Kong). 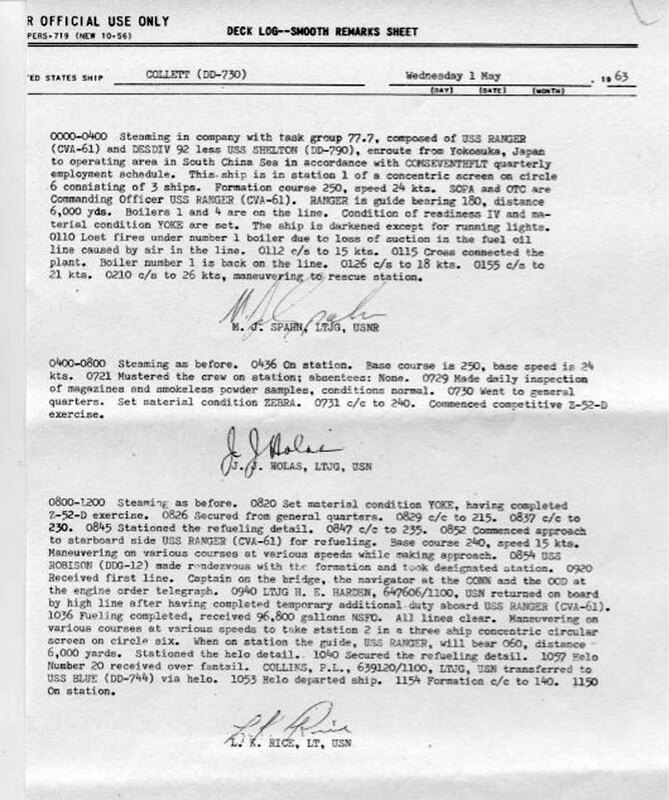 The deck log for Thursday 2 May 1963 states that the USS BLUE was assigned to a radar picket station on the 17th parallel (which corresponds to the DMZ between North Vietnam and South Vietnam). 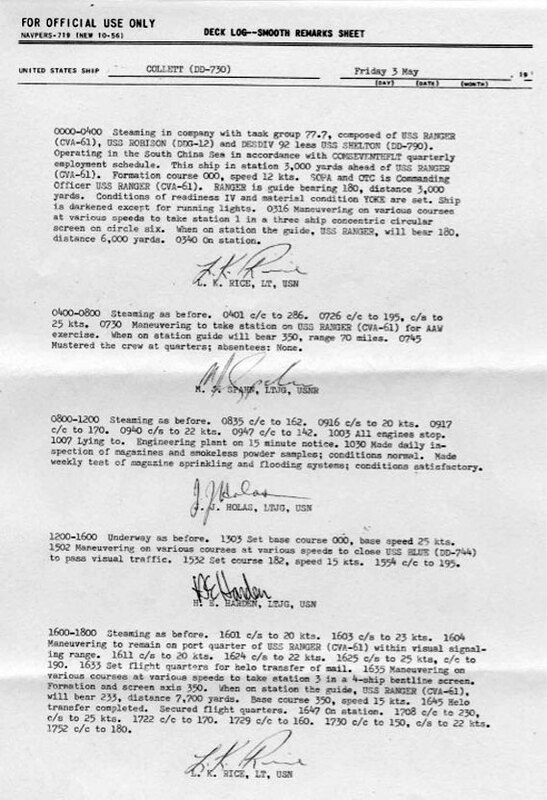 These five days in May 1963 are one of the eligible time periods for service medals for COLLETT sailors. W.W. Bischof, CDR (now deceased); R.D. Gilliham, LCDR (now deceased); H.E. 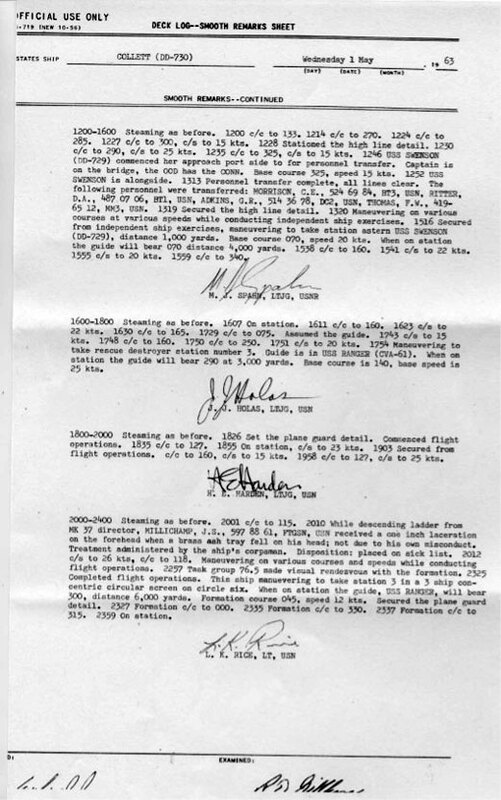 Harden, LTJG; J.J. Holas, LTJG; F.E. Madden, RD1-P2 (now deceased); J.S. Millicamp, FTGSN; H.V. 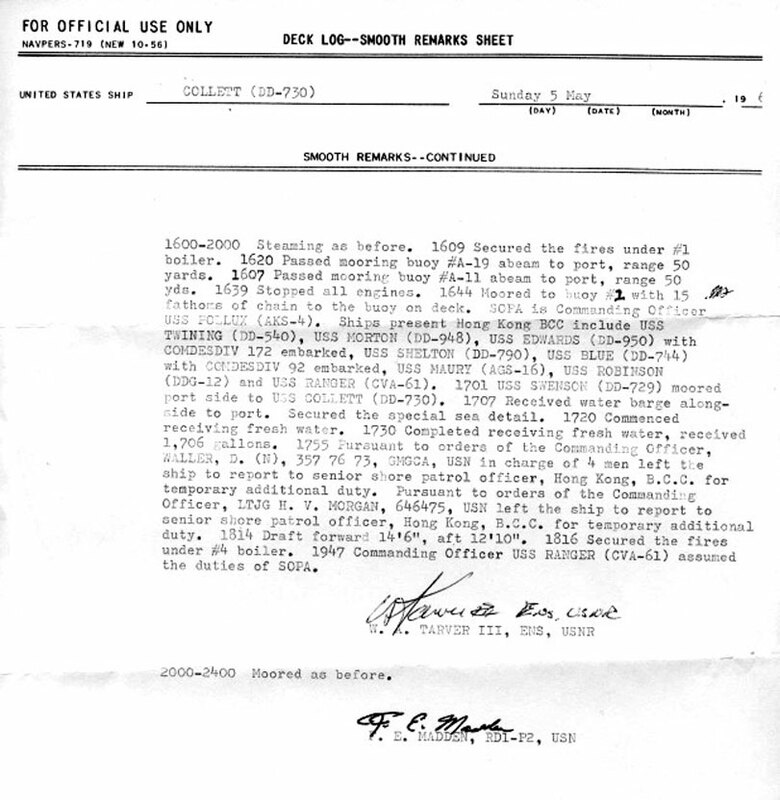 Morgan, LTJG; L.K. Rice, LT; H. Swan, ENS; W.A. Tarver, ENS. Of these shipmates, Lloyd Keith Rice is the only one we have not yet located for our Crew List. 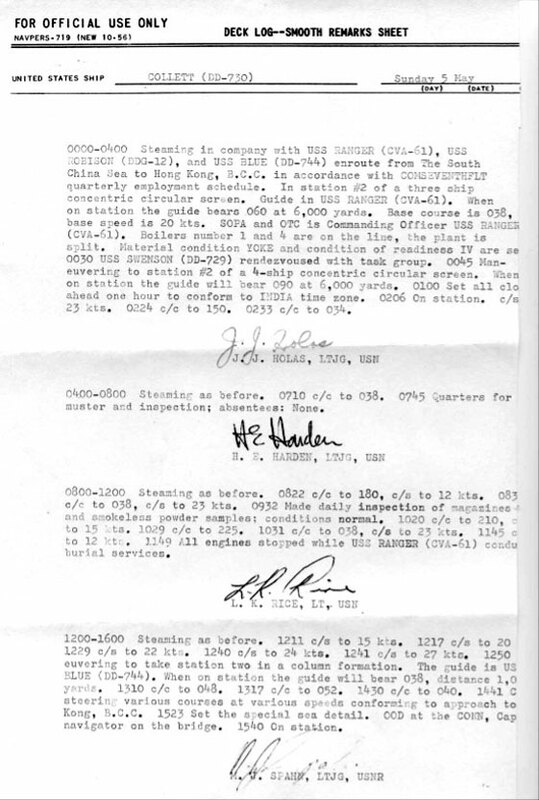 The deck log for Sunday 5 May 1963 lists the following ships as present in Hong Kong: USS POLLUX (AKS-4), USS TWINING (DD-540), USS MORTON (DD-940), USS EDWARDS (DD-950), USS SHELTON (DD-790), USS BLUE (DD-744), USS ROBISON (DDG-12), USS RANGER (CVA-61). My own log is so sketchy for the month of May that I begin this edited transcription on 23 April and close it on 7 May. Tuesday, 23 Apr. - I go to sea on USS BLUE (DD-744) for ORI [Operational Readiness Inspection]. Underway at 0730, back in port at 1645. There were a few bright spots in the ORI, like the box lunch and the skit that Moore did in the ET shop. Wednesday, 24 Apr. - Fixed shorted Trunk 2 to RMS #2 on the open bridge and corrected shorted ANGRY remote handset connection ["ANGRY" was my nickname for the AN/GRC-27, a UHF radio transceiver; a great machine when it worked but getting the auto tuning of the power amp to work properly was a bear]. Thursday, 25 Apr. - Worked on CREI lesson #227 [a correspondance course for electronics theory and application]. Friday, 26 Apr. - High pressure steam line leak, getting underway was delayed 6 hours. Modulator tube red hot in TED 4-3 [one of the UHF radio transmitters], replaced to fix. Underway about 1700. Steamed south at 25 knots, sea calm. Saturday, 27 Apr. 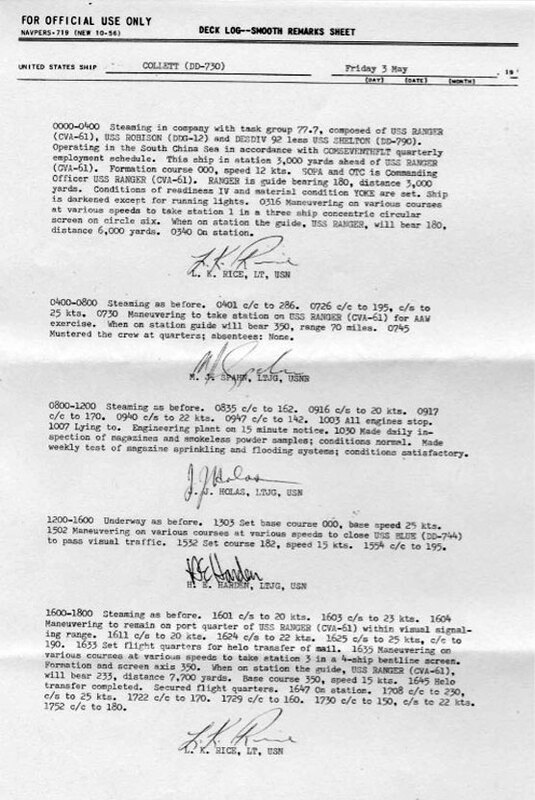 - Joined USS RANGER at 2400. I have the 2000-2400 watch [on a surface search radar repeater in CIC]. Since refueling followed (under darken ship condition), I didn't get to sleep until 0230. Sunday, 28 Apr. - I have the 0800-1200 watch. Replaced starboard window for the AN/BLR-1 [In 2006, I was pretty sure this entry refers to a plastic cover for the end of an waveguide on the ECM mast which was just aft of the secondary conn.]. Nice and breezy. Mr. Swan [the EMO] climbed up to have a look. TED 4-3's brushes replaced [bushes in the cooling motor for a UHF radio transmitter]. Weather becoming hot and sticky. Now at latitude of Okinawa. Monday, 29 Apr. - What a way to start a week. I have the 0400-0800 watch. Refueling from USS CALIENTE 0700-0730. Received an amount of fuel equal to 104% of capacity. Excess was taken on the steam line of the mess deck and on the port and starboard main decks. No breakfast except for cold meat sandwiches served after all hope had died, so naturally they were delicous. Repaired blower in mag amp controller. I have the 1200-1600 and 0000-0400 watches. A URC [a UHF radio receiver] blew a high voltage fuse due to a bad filter. To wash off the spilled fuel oil, RDs saltwater wash the ECM mast at same time Snipes hose the main deck. Attempt at an encounter was made but due to our 25 knot speed, neither stream of water could reach the other team. Mel Post and I, as innocent bystanders, hid until the coast was clear. Mail came [lowered by line from helo over the fantail]. Watched jets strafe sled while swooping down on it then pulling up to go around again. Later watched them land at night. I had just got up for midwatch when the words "Fire in the forward fan room" pierced the air. I turned on the lights, woke up 6 shipmates and made tracks out of the sleeping compartment. Gratefully the problem was minor and over very quickly. Had Midrats. Tuesday, 30 Apr. - Hot and sticky. Between Taiwan and Luzon. Have the 1200-1600 watch. 33 knot full-power run. Many elect. devices secured. "Sail" rigged portside by the break for ventilation purposes. $71 payday. Wednesday, 1 May - Have the morning watch. Afternoon with ENS Swan on gear assigned to me: AN/BLR-1, AN/URC-32, AN/GRC27, URA-8, R390, & R390A. Have the 2nd dog watch. Thursday, 2 May - I have the 0400-0800 watch. Chow for 10 minutes then underway replenishment from a reefer, ammo ship, and then an oiler until 1100. Uniform: baseball cap, skivy shirt, dungaree. Still hot. Drinking water tastes salted. Put dungaree working jacket in ship's laundry. Friday, 3 May - I have midwatch. Given an ECM exercise by Mr. Delton from the BLUE. A switch in the wrong position caused 1/2 hour of work to find. Started aligning band 7 of BLR. GRC-27 trouble. I have afternoon watch. Solved GRC-27 trouble. Showered , ate, did some unwinding from a tedious day. Watched jets from the RANGER. I have 2000-2400 watch. I missed my haircut appointment. Water tastes ok today. Crew seems a little rowdy. We've been at sea 7 days. Saturday, 4 May - Aligned band 7 of BLR during afternoon and evening. Heading for Hong Kong. Off the watch bill. Sunday, 5 May - In Hong Kong. Aligned band 7 of BLR all day. Monday, 6 May - Finished aligning band 7 of BLR. No watch duty. Post and Harvey work on GRC. Tuesday, 7 May - Aligned band 8 of BLR till 1200. Hit beach at 1400 with Armstong and Milliner. Taxi to Repulse Bay for $5HK. First time to swim in the ocean. Had T-bone steak dinner at Waltzing Matildas. And so it happened one day in the early 1960s, after we had been in port for far too long, that I, as a new Electronics Technician, was told to make an equipment room ready for sea. I got some line and set to work securing metal boxes to brackets welded to the bulkheads of the DASH equipment room. As I was knitting the boxes together into a giant heap with line the way I was taught, I peeked inside some of the unfamiliar boxes. Some held emergency “portable” radio equipment. One box was bigger than a footlocker. It held radio equipment made in the early 1940s. This was the box that most fascinated me. It included a hand-crank electric generator with a chain for attaching to a tree. It was obvious that it would take a lot of muscle power to use it. There was also an orange kite and string. Wouldn’t it be fun to fly a kite? And from a ship! But what could I use for an excuse? (Whoops, I mean what could I use for a reason!) I knew I would have to ask permission. You just don’t do what you want on a warship. I came up with a plan as I set about finishing my task of securing the boxes. Once we were underway and well at sea, on one of those days with puffy white clouds in the blue sky, I mustered up my audacity and marched up to the Officer of the Deck on the bridge (who happened to be Hank Swan, the Electronic Equipment Officer, who knew me well). I saluted and asked for permission to check out some emergency equipment by flying a kite from the stern. He suppressed most of his grin as I told him briefly why I thought there was some value to my proposal. After a short pause he said, “Go fly a kite, Olderr!” and turned away, attempting to conceal a smile about my harmless scheme. I said, “Aye, aye, sir,” and promptly rushed away. Grabbing the kite I hustled to the stern. In a mood that matched the bubbling, giggling white water churned up by the ship’s propellers, I assembled the 2-foot-square by 3-foot-long box kite and attached the string. I launched the kite. It shot up smartly and flew well. I paid out about 100 feet of line and held it tight. For several minutes I admired how well the kite flew, and I was pleased that I had been able to fly it. But, as you know, there are some things you shouldn’t wish for. Perhaps flying a kite with a metal frame attached to a copper wire is one of them, and perhaps putting yourself into a position where you might have to explain that you lost something that anyone with average intelligence shouldn’t have been fooling with anyhow. These kinds of thoughts raced around my mind as I watched the big orange kite way up high and in harm’s way. Trying not to panic, I concentrated on bringing the kite in. Cautiously pulling the string in hand over hand, I now fully realized how easy it would be to lose the kite to the ocean all around me. Would the ship change course and foul the kite string? Would the kite suddenly dive into the ocean? Finally, the kite itself was within my grasp. I took a deep breath of relief as I counted my blessings and disassembled the kite. I tucked it safely away, back in its box, and hoped that I never had to actually use the kite to hold up the copper wire which was the antenna for the radio.